That being said, Winnipeg can’t take its foot off the gas pedal against the lowly Oilers. The impressive part of the Jets’ recent streak is the fact they’ve been getting the job done without top centre Bryan Little, who has missed the last seven games with a lingering upper-body injury. 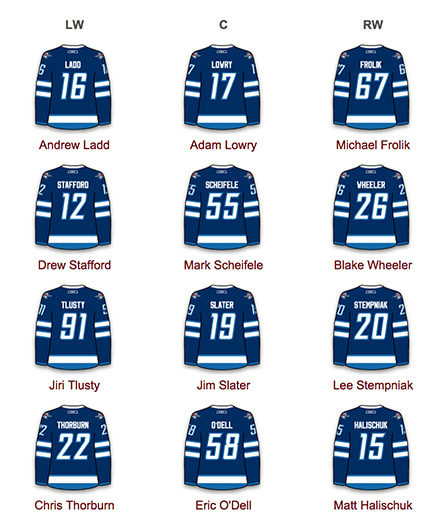 Andrew Ladd still leads the Jets in scoring with 24 goals and 57 points. Blake Wheeler continues to be Winnipeg’s hottest scorer with 10 points in his last seven games. Drew Stafford has a five-game point streak going with three goals and four assists. The Jets have been without top defenceman Dustin Byfuglien the last seven games as the blue-liner continues to recover from an upper-body injury. Tyler Myers has filled the void nicely as the six-foot-eight blue-liner is plus-3 in his last three games and has become the Jets’ shutdown defenceman. 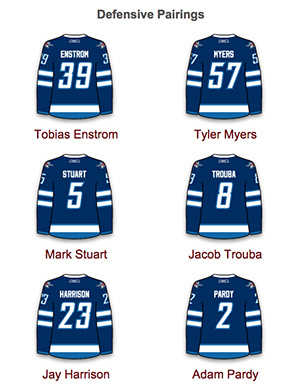 Paul Maurice will likely ride the hot hand against the Oilers. Pavelec, who was named the NHL’s first star on Monday, has stopped 113 of 117 shots during the Jets’ four-game winning streak. 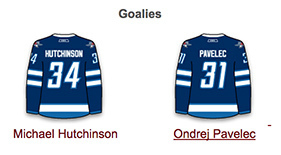 Pavelec has a 17-14-7 record and boasts a 2.40 goals against average this season. 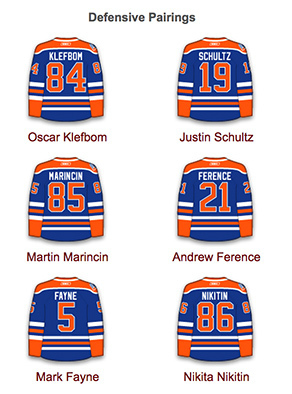 The Oilers (20-39-13) are playing for pride from here on in. Coming off a 5-4 win over the Philadelphia Flyers, Edmonton finds itself among the bottom dwellers in the NHL and in the Connor McDavid sweepstakes. Jordan Eberle — the Oilers’ top scorer — is riding a career-best seven-game point streak. The right winger has five goals and nine assists in that span. He leads the Oilers with 58 points this season. Ryan Nugent-Hopkins tops the Oilers with 22 goals. Justin Schultz has four points in five career games against the Jets. The 25-year-old leads all Oiler defencemen in scoring with five goals and 28 points. Ben Scrivens backstopped the Oilers to victory over the Flyers on Saturday, making 27 saves for his 14th win of the year. 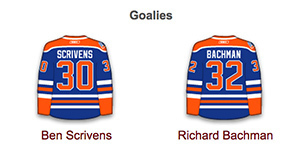 Scrivens will likely get the call between the pipes against the Jets. 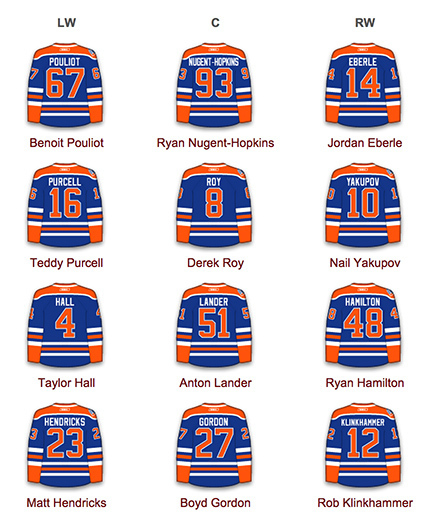 Game Day Predictions: It’s the Edmonton Oilers. I think it’s safe to say the Jets will win a fifth straight game Monday. Jets 4 Oilers 2. Obvious Predictions: Combined, the Stafford-Scheifele-Wheeler line has produced 14 points in the Jets’ last three games. There’s no sign of this line slowing down either. They will score. Not So Obvious Predictions: An Oilers shutout. Edmonton leads the NHL in goals against with 247. 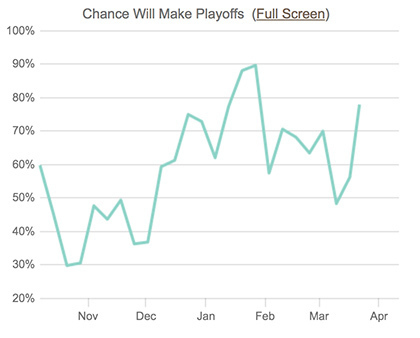 The Jets have a 77.9% chance of making the playoffs, according to clubsportsstats.com. I’ll be at Rexall Place cheering on the Jets tonight! Go Jets Go!